Pepperidge Farm has purchased many of our dust collectors, models RD-211-QL, RD-337-QLH, and model RD-455 for use in their plants all over the U. S. They use our model RD-337 for keping the air clean along the Goldfish seasoning line. 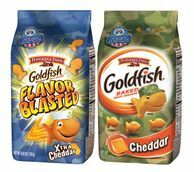 To honor those who serve in the U.S. Armed Forces, the Pepperidge Farm® Goldfish® brand announced its $25,000 donation to the Fisher House Foundation. The donation will be used for the Foundation’s Scholarships for Military Children program which helps U.S. military families worldwide pay for their children’s college expenses. The scholarships are designed to recognize the important role of the commissary in the U.S. military family community and are primarily funded through the generosity of manufacturers and suppliers whose products are sold at military stores.